Definition: A pick-and-roll half-court set off the slot with shooters on the opposite slot and in both corners. 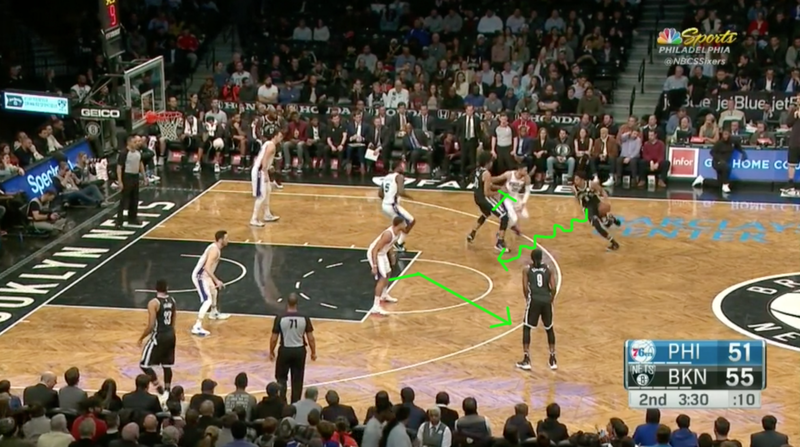 Explanation: One of the guiding principles of NBA offense is proper spacing. In pick-and-roll — the most common form of offensive creation — this is particularly important. Without room to maneuver, a ball-handler or roller can get tangled in a mess of bodies, eliminating any initial advantage created by a ball-screen. The most common pick-and-roll spacing places the ball-handler on one slot, a shooter on the other, and two more in the deep corners. 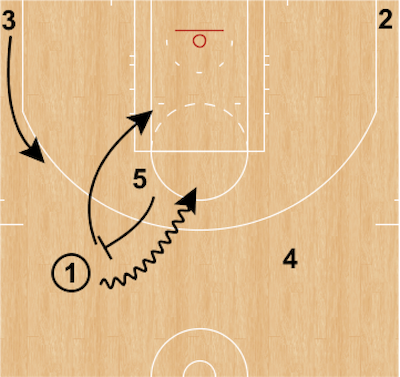 With the 5 setting the ball-screen, this alignment stretches the defense to its maximum. Some teams naturally operate out of this alignment in non-organized half-court play; other teams label this alignment “Angle,” which mandates optimal spacing for the pick-and-roll to come. Many teams take their Angle series one step further and even direct certain sequences of player spacing. In particular, a lot of teams prefer to have their 4s lifted — that is, on the slot opposite the ball. Not only does this draw a big away from the paint, but it forces him to guard in a position normally reserved for guards. One of the main benefits of any “Angle” play is that it stresses help defenders by pushing shooters to the deep corners. On any basketball play, the instinct to creep toward the ball can be overwhelming. This, however, can have the unintended consequence of bringing help defenders closer to their responsibilities, thus blowing up any ball-screen before it can get started. 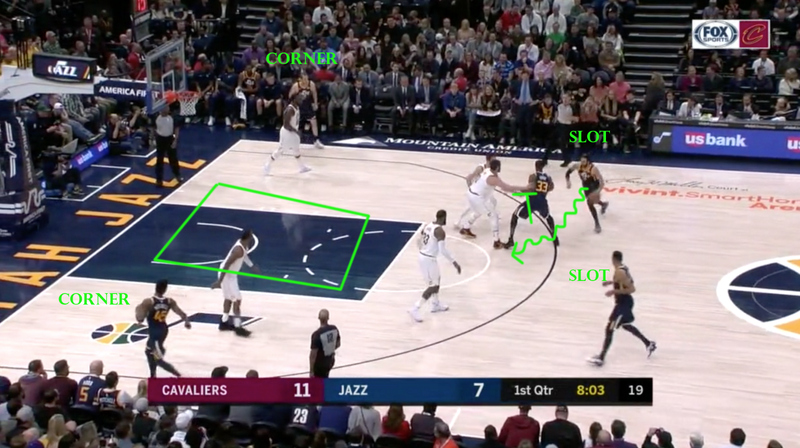 That is why many teams use a specific play-call for what is seemingly just a spread pick-and-roll: it gets everyone in the right spots, instead of approximations of perfection. One of the other major benefits of the “Angle” alignment is the way in which it empties out the paint. Because Cleveland has to stick to every player, there is no one to man the paint as a driving deterrent. When the Cavaliers do not properly execute their pick-and-roll defense, Rubio is able to glide right to the basket without secondary resistance. One of the main ways in which perfectly spread pick-and-rolls succeed is in their ability to attack the nail defender. According to normal defensive principles, a defender pushes over to the nail when the ball is declared on one side. This serves as a deterrent to penetration and should theoretically allow this defender to recover on the kickout as well. In practice, the defense is forced into a decision. If the player on the slot opposite the ball is a shooter, the nail defender — who has pushed over from that slot area — has to worry about cutting off penetration while resisting the temptation to over-help and give up a three-point shot. With the ball-handler jetting middle, it’s only a short pass to the opposite slot for a catch-and-shoot look. On this Brooklyn Nets pick-and-roll, look at how Justin Anderson of the Philadelphia 76ers is positioned near the nail as the play unfolds. It appears as if he will have enough time to close out to his man, DeMarre Carroll, on the opposite slot should Spencer Dinwiddie kick it to him. The moment Anderson takes a single step toward the ball, Dinwiddie fires a pass to Carroll. Anderson, with his momentum moving in the opposite direction, is unable to recover in time. This is the power of the Angle alignment: the offense stretches the defense out just far enough to force a decision, and the offense capitalizes on the opposite of whichever path the defense chooses. Here, a single misstep leads to an open three-point shot. With only a simple alignment tweak, Angle allows the offense to limit a layer of defensive resistance. In order to defend an Angle pick-and-roll, many defenses try to ice the initial ball-screen. By keeping the ball on the sideline, this nail dilemma is eliminated and the ball-handler is pushed into the traffic of the corner. As noted in previous Dictionary entries, offenses respond to this defensive action by changing the angle of the screen and setting a step-up. Sometimes the ball-handler will even snake his dribble, allowing him to get middle anyway. Despite these counters, the defense still usually wins an advantage with an ice. Instead of a straight-line path to the rim through the middle of the floor, the ball-handler is caught heading toward the baseline and away from the rim. Although he might still be able to get to the rim, Durant has less room to work with. 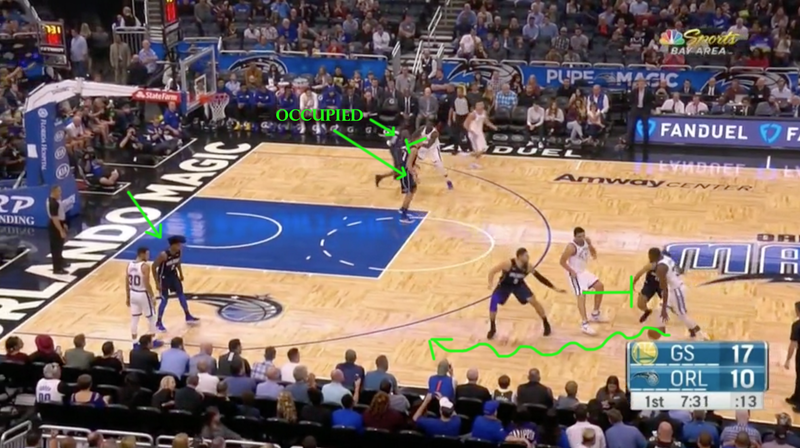 Elfrid Payton of the Orlando Magic is in the strong-side corner ready to stunt, and Nikola Vucevic and Evan Fournier have the ball corralled on the sideline. As the play develops, Durant is confronted by Vucevic and Fournier while Pachulia rolls right down the middle of the lane. Normally, one of Orlando’s two weak-side defenders, Aaron Gordon and Jonathan Simmons, would tag Pachulia — ideally from the nail — and prevent an easy pocket pass. Instead, they are occupied by the weak-side pindown Draymond Green sets for Klay Thompson. By the time Gordon spins his head around to the main action, he is way too late for the tag. Simmons, meanwhile, is dragged away from the nail as he follows Thompson. This allows Durant to hit Pachulia, and Pachulia lays it in for an easy two points. This action serves as a common counter to the icing of an Angle ball-screen. Whether it’s a simple exchange, pindown or flare, many teams use this type of two-man, weak-side screening when the ball is on the other side of the floor. At worst, it accomplishes nothing. At best, it throws the defense off just long enough for them to neglect their help responsibilities. And even though the Warriors get out of their Angle alignment on the weak side, the action succeeds due to the initial Angle spacing. Because Thompson stays on the opposite slot and does not creep toward the ball, he draws Simmons away from a reasonable help position. Same goes for Green: the pindown is angled toward the corner, pulling Gordon down that way as well. Below is a video compilation of various examples of NBA offenses running Angle pick-and-rolls. Whether it’s a called, half-court set or the natural result of a team’s offensive spacing principles, notice how the alignment lengthens the distance each help defender has to cover. Previously: Atlanta Hawks D-League Scout, Fort Wayne Mad Ants Assistant Coach (NBA D-League). 2014 D-League Champion.